Andrea Monfried Editions LLC, 9780991026302, 240pp. The first monograph published on Hildreth Meiere, an artist whose name is not widely recognized but whose work is prominent and well known (St. Bartholomew's Church, Temple Emanu-El, Nebraska State Capitol, National Academy of Sciences, etc.). Directly promoting the extremely popular Art Deco movement in America including the architectural history and decoration, women artists, world's fairs, American mural painting, twentieth-century mosaics and ceramics, the Byzantine revival in America, and American liturgical art. Large-scale color photographs (created over more than 10 years by the artist's granddaughter, Hildreth Meiere Dunn) capture these exquisite works in detail An unsung heroine of Art Deco art and architecture, Hildreth Meiere is the artist behind many of the most spectacular mural installations of the mid-20th century. The vibrant, dynamic roundels on the exterior of Radio City Music Hall, the shimmering glass mosaics and stained glass windows at St. Bartholomew's Church, and the exceptional decoration at the Cathedral Basilica of Saint Louis - all are the work of Meiere. Meiere is particularly known for her personal interpretation of Art Deco, which incorporates Byzantine, classical Greek, and Native American influences. Meiere rose to prominence in the 1920s with two commissions from pioneering architect Bertram Goodhue: the National Academy of Sciences in Washington, D.C., and the Nebraska State Capitol in Lincoln. Her 100 religious, corporate, and cultural commissions are equally noteworthy. 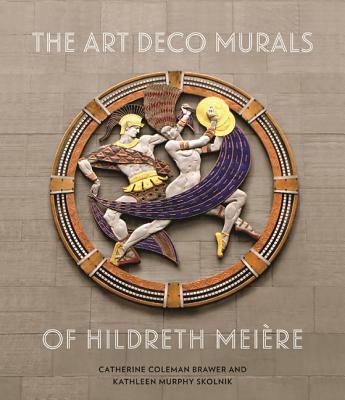 This first monograph on the artist, featuring stunning, large-scale color photographs, examines her distinctive Art Deco designs within the context of American art and architecture in the first half of the 20th century. Catherine Coleman Brawer is an art historian and curator. She curated the exhibition Walls Speak: The Narrative Art of Hildreth Meiere (in New York and Washington, D.C.), which attracted 40,000 visitors, and wrote the accompanying catalog.Kathleen Murphy Skolnik is an art and architectural historian, is a faculty member in the Department of History, Art History, and Philosophy at Roosevelt University. She collaborated with Robert Bruegmann on The Architecture of Harry Weese. She is the editor of the Chicago Art Deco Society Magazine and has written extensively on Art Deco-related topics and spoken at the World Congress on Art Deco."